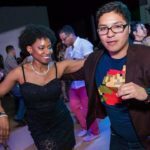 Jorge “Yoshi” Sanchez has over seven years’ experience in Latin dance and has grown within the dance community as an instructor and performer. Yoshi is the founder of Salsa con Son, an international online dance community that gets invited to perform and teach at international events, as well as the artistic director of the dance team by the same name. Bachata, Cumbia & Salsa dance lessons.